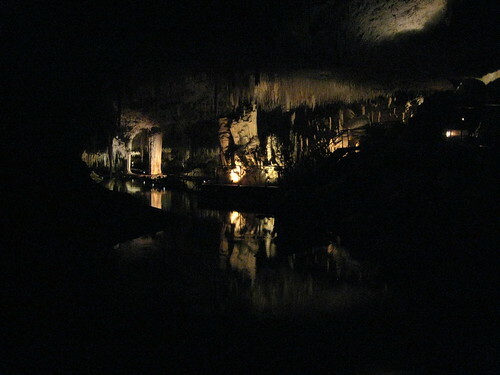 Before we began the day’s wine tastings we decided to expore another of the area’s features: caves. We drove to the southern end (more or less) of the region and booked in at Lake Cave. We had a little time to kill before getting started so we tried zooming down the road to Eagle Vale, but they weren’t open. The cave itself was better than I expected. It wasn’t cheesy and, as the name suggests, featured a small lake on the floor of the cave. We had an interesting tour, saw some beautiful underground sights, even spent a few moments in complete darkness. It was a worthwhile visit, even though we had to climb some 300+ steps on the way out. Our first winery of the day wound up being Redgate, which was okay. They were sold out of the Cab Franc that we’d wanted to try, but we picked up a very nice Chenin. By this time our rummies were tumbling, so we stopped in the actual town of Margaret River for lunch at Must. It was very good — the brother claimed his burger was one of the best he’d ever had — but it took a long time. Not that we were on a tight timeline or anything, though, so we didn’t particularly care. Stella Bella, a favourite of the brother’s and, now, of ours. We ended up ordering a case from them, six for the brother and six for us: two Cab Sauv, two Sauv Blanc and two sweet dessert wines. I don’t know what we’ll do with them all, but at least two of them are coming back to Canada with us. 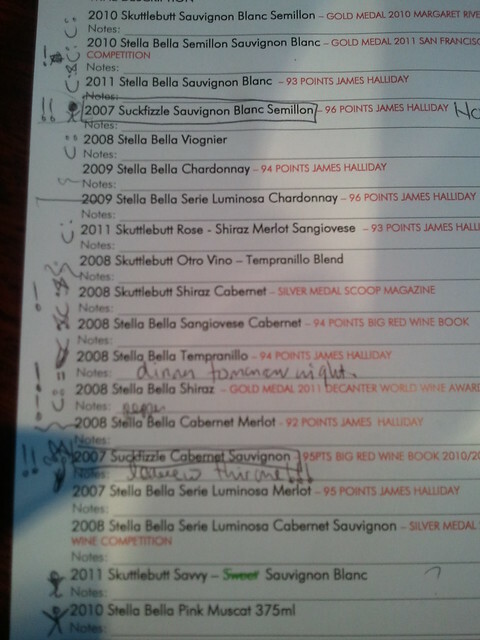 Here’s Nellie’s scoring system from the tasting sheet. No, we couldn’t understand it either. It was late afternoon by this point, and we decided we needed more of that fresh bread. We returned to the bakery and saw people literally hugging their bread as they walked to their car. One gentleman was so hungry he began biting chunks off the bread cradled in his arms while walking to his car. After we picked up our loaves, Nellie took a page from his book and ripped into the white bread just as he had done. The bread would not be denied. We were a little too tired for a giant meal, and the first place we called was booked up anyway, so we visited a nearby wine bar and had tapas. Decent food, and blessedly small. The weather turned foul on the way home — lightning and heavy rain — so there was naught to do but hunker down and plan the next day’s visits. ← Day 5: To the wine!